Create a living legacy on our campus. Name a tree. Celebrate a special person who has touched your life or leave your own mark on the university by naming a tree. A $2,500 gift covers the cost to plant and care for the tree for life, along with a dedication plaque. Multiple donors can contribute to a single tree. Monthly payments and payroll deductions are accepted. Please contact advancement@uoit.ca or 905.721.8668 ext. 5660 to name your tree. The tree plaque will be ordered only after the tree is fully paid. Donors should request their plaque after final payment. 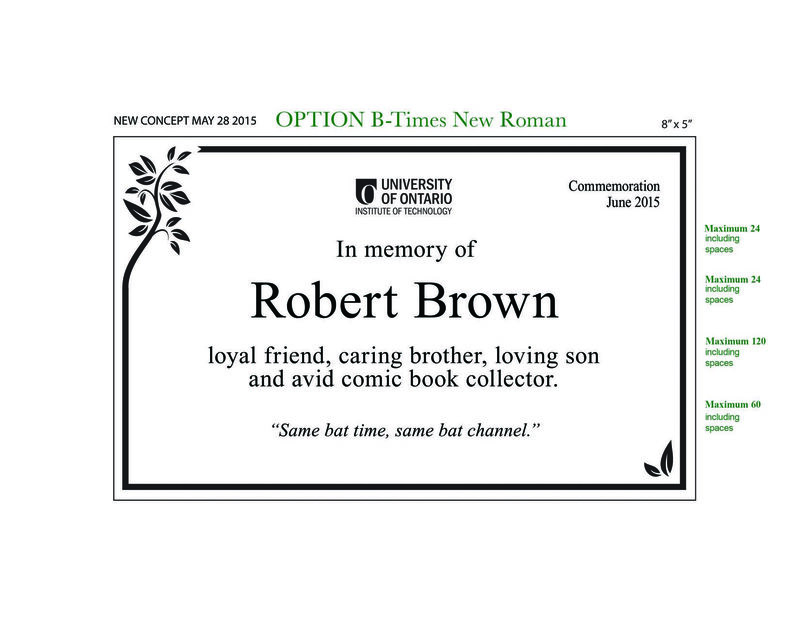 Size of the plaque is standard for all commemorative trees (5” x 8” x ¼”). Type of font and size of font are standard for all plaques. Personalized messages may be included on the plaque to a maximum of 81 characters (not including spaces) distributed across three lines under the name. Do not include birth or death dates. The month and year of the celebration are included on the plaque. Messages are text only. Please refrain from using icons, logos and symbols. Quotes must be attributed to their author. The attribution is to be included in the 81 character maximum (not including spaces). Messages must follow the university's Editorial Style Guide. The university reserves the right to edit and approve all messages submitted.